Christmas mood haven't finish , Chinese New Year mood is here too! 8th November 2013 was an unusual day for all of the unfortunate Filipinos – the strongest typhoon ever recorded in history with a maximum wind speed at 315km/h blasted Philippines, washing away thousands of valuable lives, half-a-million of the Filipinos’ homes and affecting more than ten million of Filipinos. The tragic scenes during the typhoon were way more dramatic than you could ever imagine. For instance, a high school teacher told of watching the last moments of her daughter’s life and hearing her unforgettable last words: “Ma, just let go. Save yourself.” A lady said she watched an old man die — they were both swimming for their lives when an iron roof sliced his neck. 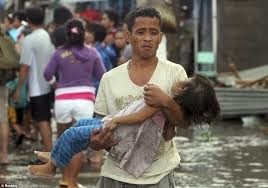 In addition, countless pregnant women died in the typhoon with their unborn babies. Victims blessed to survive are currently living with untold sufferings. Living in the open without a shelter, the victims, especially the innocent children, are forced to bear the hotness in the day and coldness at night. Without sufficient supply of foods and potable water, an egg and half-a-cup of coke in a day become a luxury for most of them.Some are even suffering from diarrhea and dehydration due to shortage of food and water. They are starving most of the time, exhausted, but survivingin the hope of getting assistance for a future. The typhoon-hit victims in Philippines need your help.